Published: Jan. 13, 2014 at 09:43 a.m. 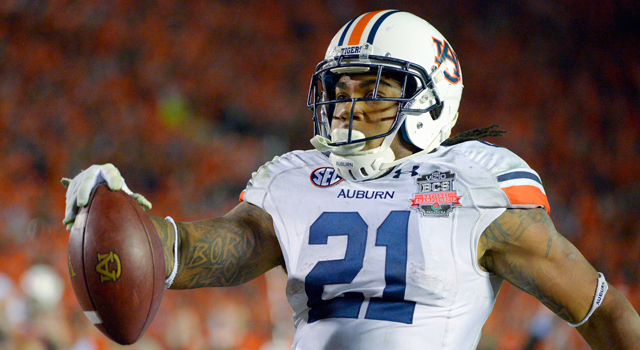 Updated: Jan. 13, 2014 at 03:35 p.m.
Auburn RB Tre Mason rushed for 973 yards and nine touchdowns in five games against top-10 teams this season. There's a good chance that we will not see a running back drafted in the first round for the second year in a row. Go back about 75 years to the third draft in NFL history, when there were 10 teams in the league and nine of them picked a running back in the first round. You might say that times have changed. It's not just that teams are throwing the ball more now than they did in the past. Their priorities have changed. 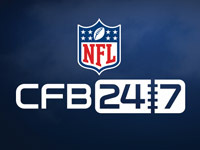 The feeling among NFL teams now is that there are a lot of good running backs out there, and it's much easier to find them further down in the draft than a top quarterback, offensive lineman or defensive lineman. You could name any number of examples. This season in the NFL, two of the top offensive rookies in the league are running backs, Cincinnati's Giovani Bernard and Green Bay's Eddie Lacy, and both were drafted in the second round. The call for running backs in the draft is not like it used to be, but that doesn't mean the talent is no longer there. My top running back in this year's draft is Auburn's Tre Mason, whom you might recall I compared to Cowboys great Tony Dorsett after his 304-yard rushing performance against Missouri in December. The Dorsett comparison had to do with Mason's unbelievable quickness -- he's the kind of back who can start and stop on a dime and leave you eight cents worth of change. Nothing has changed about my evaluation of Mason in the last month. He had a fantastic season, ending it with a very good game against Florida State in the BCS championship game, rushing for 195 yards and scoring two touchdowns. What I like about Mason, besides that quickness, is that he performed so well in big games against good defenses. In five games against top-10 teams (including the BCS title game), he ran for 973 yards and nine touchdowns; he finished the season with 1,816 yards and 23 touchdowns. He also became the first non-quarterback to lead Auburn in total offense since Bo Jackson did it in 1985. Anytime a guy racks up nearly 2,000 yards of offense while playing in the SEC, you're looking at a pretty productive player. Mason recently received a third-round grade from the Draft Advisory Board. I would put him more around the second round. You would like to have a running back who's a little taller and heavier than Mason, but he's not a bad size for a running back, at about 5-foot-9, 205 pounds, and anyway, his speed makes up for whatever he lacks in size. It's also true that Auburn's offensive system helps players like Mason be productive, but I believe that his quickness and running ability will allow him to be very effective in whatever system he plays in. I think Mason is the best running back in the draft. In terms of skills, he doesn't have to improve anything. He can catch the ball really well, he's got good vision and he's tough. I believe he will be a real threat as a runner in the NFL. And he can also do a lot of other things for you, including returning kicks. Bishop Sankey, Washington: Sankey has had great success the last two seasons at Washington, including rushing for 1,870 yards and 20 touchdowns as a junior. He's got outside speed, catches the ball well and does a nice job in pass protection. He's a durable back who runs hard. I like him a lot and think he'll be a good, solid back in the NFL. Carlos Hyde, Ohio State: Hyde is very similar to Le'Veon Bell, the Pittsburgh Steelers rookie who was drafted out of Michigan State in the second round. His speed and quickness might not be off the charts, but he's a big back that can do everything pretty well, including catching the ball. He also has a skill not a lot of college backs have, and that's pass protection. Devonta Freeman, Florida State: A true junior, Freeman is a short, compact runner who is very effective between the tackles, rushing for 1,016 yards on 5.9 yards per carry this season. He's also a good receiver, with 47 catches in his three seasons. He's built a lot like Redskins RB Alfred Morris but doesn't quite have the same skill set. I have him ranked ahead of teammate James Wilder Jr.
Lache Seastrunk, Baylor: Seastrunk was one of the main reasons Baylor's offense was so good this season. The Bears spread everyone out, giving a good inside-the-tackles runner like Seastrunk the opportunity to pick up big yards. He missed a few games this season because of injuries, and Baylor's offense was not as productive when he was sidelined. He's another running back who has very good quickness and catches the ball very well. Charles Sims, West Virginia: Sims is a little bit of a sleeper who will stir up a lot of interest as draft day nears. West Virginia didn't have a good offensive line this season, and it hampered him, but he is a very good all-around back who can really catch the ball well and is a good runner. Terrance West, Towson: West set an FCS record with 2,509 rushing yards and also scored 42 total touchdowns in helping Towson reach the FCS title game against North Dakota State. He's a shorter, stockier running back who doesn't have great speed, but his performance in the FCS was very impressive. Check out the best moves of college football cheerleaders in 2013. James Wilder Jr., Florida State: Wilder Jr.'s dad is a former running back who played for Tampa Bay, and he looks just like his dad when he runs. He's a strong runner with pretty good movement, not a straight-line guy, and he catches the ball pretty well. Marion Grice, Arizona State: Grice is a good-sized back at about 5-11 3/4 and 205 pounds, with 4.5 speed. He had a productive year in a good conference and was named second-team All-Pac-12. Silas Redd, USC: Redd shared time this year and didn't put up the numbers we saw in his previous two seasons. He rushed for 1,241 yards at Penn State in 2011 and was productive in 2012, when he transferred to USC. He's a big back at about 212 pounds, and I think he's a good, solid football player. Dri Archer, Kent State: At 5-8, 180, Archer's size will be a concern, but he's quick as a cat, which will give him a chance to succeed. Archer is also good on kick returns. Ka'Deem Carey, Arizona: He has not declared. No other comments at this time.